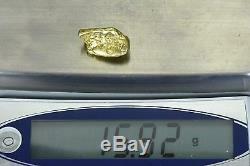 Alaskan Natural Gold Nugget weighs 15.92 Grams. Natural Gold Nuggets can have other mineral content such as silver and copper mixed in with them and are never 24kt gold. Each nugget comes to us directly from the miner in an unclean state. We remove most of the dirt and rock and tumble them to bring out it's natural shine. All Nuggets are Pictured or Partially Pictured with a U. Quarter which is 24.5MM in diameter to give you an idea of size proportion. My name is Grant I come from a 4. Generation family of jewelers and gold dealers. His son , my grandpa Roy who made gold nugget jewelry in retail store started wholesaling them and the business grew so much he opened up the company called Orocal in the mid 1960's. I have a background with a business degree with a concentration in online communication. I was the first one in the family to put Gold Nuggets on the Internet and sell to thousands of people from all over the world. We believe that by giving back this allows us to be blessed with new connections finding gold. 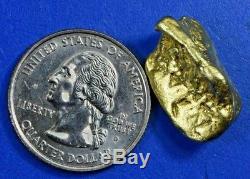 All nuggets are pictured by a US quarter for comparison witch has a diameter of 24.66 mm and a width of 1.75mm. The scale is calibrated before every batch and the scales are new. The nuggets are also pictured on both sides. What is a Natural Gold Nugget? It is a piece of gold that broke out of quartz deposits within the earth when erosion took place. It also goes by the name Placer Gold and each piece is a one of a kind with no two being exactly alike. Where can they be found? Wherever the effects of erosion took place. That would include rivers, streams, ancient dried up river channels and underground riverbeds. Gold nuggets range from 65 to 95 fine 16-23KT gold and can have other mineral content such as silver and copper mixed in with it. What sizes do they come in? They can be found in rivers and streams using a gold pan or suction dredges that act like an underground vacuum cleaner. Larger operations use large machinery that dig up huge sections of dirt weighing several tons and run it through machines that separate the gold from the dirt. Nuggets are also found using a metal detector. Because it was formed underground in quartz deposit you often find quartz mixed in with it. When they broke off into the rivers and streams they tumbled against the sand and gravel, which gave the nuggets, its texture but dulled it. They can be cleaned in different solutions, and then tumbled in different media to give it the shine. What do we mean by Authentic Alaskan Yukon BC Nugget. Not all Gold nuggets are natural, some people man-make them by taking smaller gold flakes melting them and casting them into the shape of a nugget. 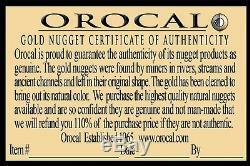 Make sure to ask if they are genuine natural gold nuggets as found by the miners and come with a certificate of authenticity. Quarter to give you an idea of Size Proportion. 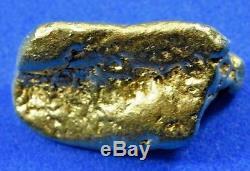 The item "#390 Alaskan BC Natural Gold Nugget 15.92 Grams Genuine" is in sale since Friday, April 20, 2018. This item is in the category "Coins & Paper Money\Bullion\Gold\Nuggets". The seller is "nuggetsbygrant" and is located in Oroville, California. This item can be shipped to United States, Canada, United Kingdom, Denmark, Romania, Slovakia, Bulgaria, Czech republic, Finland, Hungary, Latvia, Lithuania, Malta, Estonia, Greece, Portugal, Cyprus, Slovenia, Japan, Sweden, Indonesia, Thailand, Belgium, France, Hong Kong, Ireland, Netherlands, Poland, Spain, Italy, Germany, Austria, Singapore, Switzerland, Norway, Croatia, Malaysia.